COATINGSPRO MAY 2016 43 minute and until uniform, as per General Polymers specs. Tey then added one part resin (3460A) to four parts hardener (3460B) plus 20 percent potable water. Tis mixture was stirred at low speed until uniform. Confdent that their ratios and mixing sequence would generate proper cure and performance, the crew started carting buckets to the opposite end of the long, narrow room. Before priming in earnest, Seay and DCV squeegee/roller whiz Troy Trent needed to accurately establish a spread rate. Seay used a Bosch laser rangefnder to accurately mark of several 250-square-foot (23.2 m²) areas. Trent then dipped and rolled with an 18-inch (45.7 cm) roller sleeve with a 3-inch (0.95 cm) nap cover until he established a 6- to 8-mil (152.4– 203.2 microns) coating wet flm thickness (WFT) that would yield approximately 250 square feet per gallon (23.2 m² per 3.8 L) specifed by General Polymers. Once Trent got a feel for the coverage rate, the primer application went smoothly. Te DCV crew knocked of for the night to allow the 3460 to cure. Everyone was tired, but they knew they needed a good night's sleep. Te next day was going to be a bear! 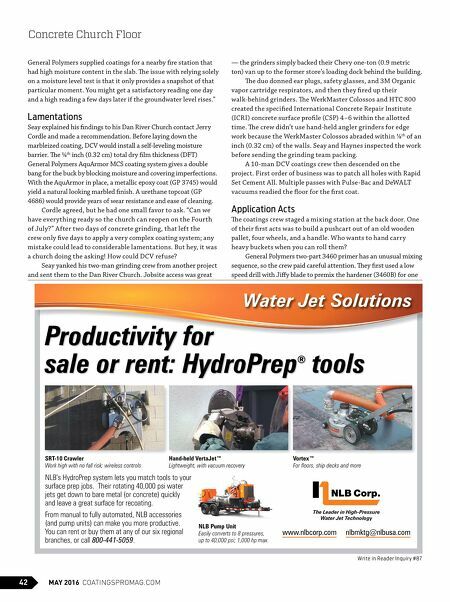 By the Numbers "Slurry applications are very stressful because they're seamless," said Seay, noting that the General Polymers slurry is the same JOB AT A GLANCE PROJECT: Apply decorative epoxy to a concrete floor in new entryway at a church in Danville, Va. COATINGS CONTRACTOR: Decorative Concrete of Virginia 14719 Wards Rd. Lynchburg, VA 24502 (434) 851-3510 www.decorativeconcreteofvirginia.com SIZE OF CONTRACTOR: 10 people on average SIZE OF CREW: 12 crew members PRIME CLIENT: Dan River Church 2805 Riverside Dr. Danville, VA 24540 (434) 582-2020 www.danriverchurch.org SUBSTRATE: Concrete CONDITION OF SUBSTRATE: Fair; about 45 years old SIZE OF JOB: ~9,000 sq. ft. (836.1 m²) DURATION: Seven days over the course of two weeks UNUSUAL FACTORS/CHALLENGES: » The church sits near a river, but the concrete slab showed no signs of groundwater intrusion. A self-leveling moisture barrier was installed as insurance against any future rise in the water table. 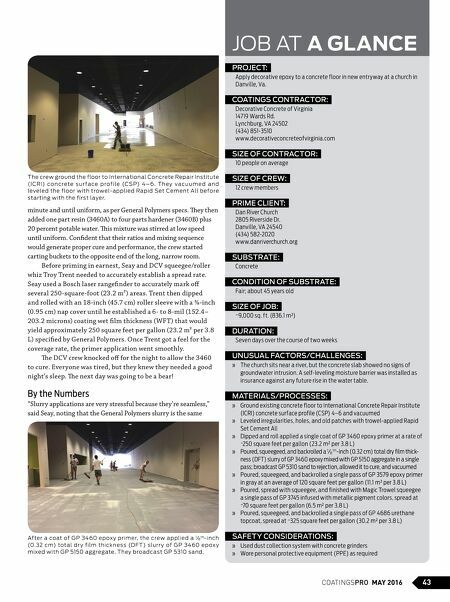 MATERIALS/PROCESSES: » Ground existing concrete floor to International Concrete Repair Institute (ICRI) concrete surface profile (CSP) 4–6 and vacuumed » Leveled irregularities, holes, and old patches with trowel-applied Rapid Set Cement All » Dipped and roll applied a single coat of GP 3460 epoxy primer at a rate of ~250 square feet per gallon (23.2 m² per 3.8 L) » Poured, squeegeed, and backrolled a 1 / 8 th -inch (0.32 cm) total dry film thick- ness (DFT) slurry of GP 3460 epoxy mixed with GP 5150 aggregate in a single pass; broadcast GP 5310 sand to rejection, allowed it to cure, and vacuumed » Poured, squeegeed, and backrolled a single pass of GP 3579 epoxy primer in gray at an average of 120 square feet per gallon (11.1 m² per 3.8 L) » Poured, spread with squeegee, and finished with Magic Trowel squeegee a single pass of GP 3745 infused with metallic pigment colors, spread at ~70 square feet per gallon (6.5 m² per 3.8 L) » Poured, squeegeed, and backrolled a single pass of GP 4686 urethane topcoat, spread at ~325 square feet per gallon (30.2 m² per 3.8 L) SAFETY CONSIDERATIONS: » Used dust collection system with concrete grinders » Wore personal protective equipment (PPE) as required The crew ground the floor to International Concrete Repair Institute (I CRI) co n c r e te s u r f a ce p r o f i le (C SP) 4 – 6 . T h e y v a c u u m e d a n d leveled the floor with trowel-applied Rapid Set Cement All before star ting with the first layer. Af ter a coat of GP 3460 epox y primer, the crew applied a 1 / 8 th -inch (0. 32 cm) total dr y film thick n e s s (DF T) slurr y of GP 3460 ep ox y mixed with GP 5150 ag gregate. They broadcast GP 5310 sand.